We were commissioned by the Mabey Group to develop a masterplan for the former Mabey Bridge works on the edge of Chepstow Town Centre. The site is allocated within the Monmouthshire LDP for a range of uses including residential (500 new homes) and employment. 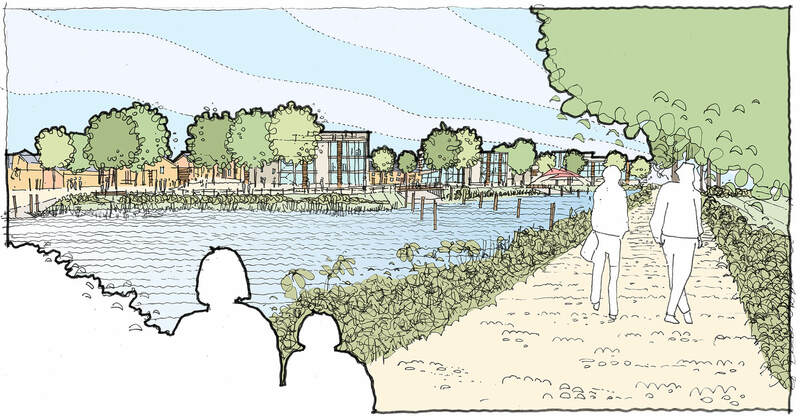 We have, as part of a multidisciplinary consultant team, created a masterplan which builds on the unique opportunities of this key riverside site. The proposals would create a new neighbourhood for Chepstow and, in doing so, would open up a significant stretch of river frontage for public access with opportunities to become part of the Wales Coast Park. A key factor in the development of the masterplan has been the significant ecological constraints and opportunities of the site,being adjacent to the River Wye SAC designation. We worked closelywith biodiversity consultants to help create a masterplan whichpositively responds to this context. An outline application wassubmitted in October 2014 and subsequently approved.